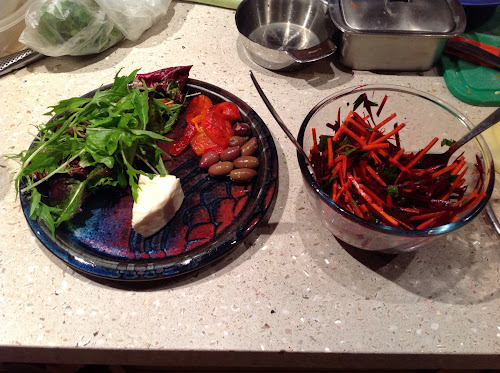 Today Lizzie posted a beetroot and carrot salad recipe. Spookily today in the organic veg mix there were beetroot and carrots. That's dinner sorted, along with local salad greens and local feta. I didn't have mint so used parsley, and also added a dash of lime olive oil and some chermoula spice mix. Lovely! Looks good. Love coincidences I must of put some root vegetable thoughts yesterday.